The most complete Spanish Course available is now in Book & CD Version. 8 levels are available. Each level includes one book and 5-8 corresponding CDs. The world's best Spanish course just got better! Don Casteel fluent in several languages and a former Foreign Service Officer, is well trained in the FSI method. He has completely revised and improved "the course that works." This 2002 Edition has improved audio with both male and female voices and over 200 illustrations with factoids, and the content is more contemporary than ever. This new version has retained the same grammatical and language content that has made this the most widely sold course on the language market. Eight levels are available to lead you to mastery of Spanish. Once completed you will be able to understand spoken and written Spanish; it will also allow you to actively engage in conversations with an abundant vocabulary of several thousand words. 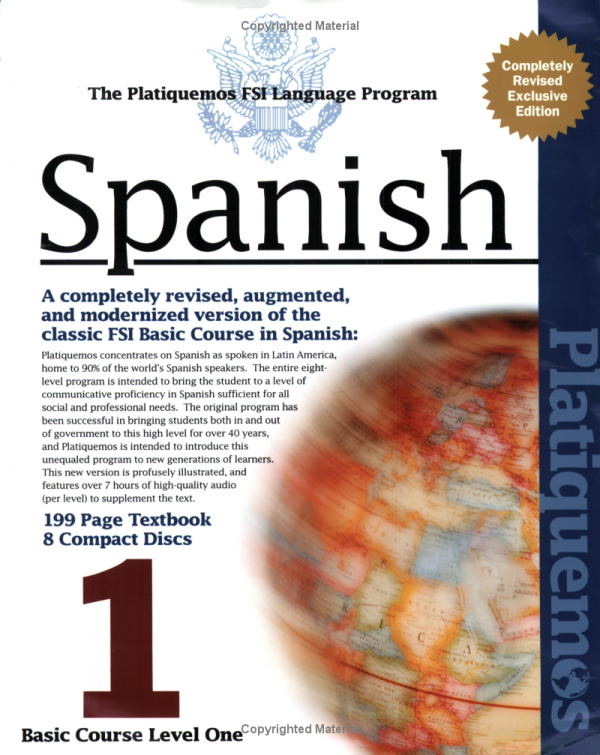 Platiquemos was prepared specifically to train officers of the Foreign Service and of other United States Government agencies who are involved in foreign affairs and who need to learn to speak Spanish, and has been modified and adapted from its original format to make it applicable to a wider audience and to make it easier to read and use. The original FSI Basic Course in Spanish consists of four volumes with a total of well over 2,000 pages. In order to make the program more manageable, it has been divided it into eight levels, with the original text re-formatted for clarity and simplicity and modified to make it more relevant to non-government students; also included is new cultural information and interesting illustrations. The texts average about 175 letter-size pages, and each Level has audio, replicating the drills and exercises found in the text. The method is known as guided imitation. It may appear new, but it actually has been used by a considerable number of teachers for many years. As used in this program, it combines elements of the "direct", "audio-lingual", "communicative", and "grammar/translation" methods; other methodologies, such as Total Physical Response can also be used with the program. Its goal is to teach students to speak easily, fluently, with very little accent, and to do this without conscious effort, just as one speaks their own language without conscious effort. There are two very important aspects of this method. The first is learning a relatively small body of material so well that it requires very little effort to produce it - this is called overlearning. If the student overlearns every dialogue and drill as they goes through this program, they will almost certainly make rapid progress in learning the language. The second aspect is learning to authentically manipulate the sounds, sequences, and patterns of the language. The important implication here is the reality of both the model and the imitation. The model (teacher, recording, etc.) must provide Spanish as people really speak it in actual conversations, and the student must be helped to create an accurate imitation. Above all, the normal tempo of pronunciation must be the classroom standard; slowing down is in this context distortion. The first two units are focused primarily on pronunciation problems. Drills on other aspects of the language are deliberately postponed because of the importance of developing good pronunciation habits from the very beginning of the course. The importance of pronunciation cannot be over-emphasized; it is the basis of all real fluency. A person will be able to understand anything they can meaningfully say themselves if there is a close similarity between the way they hear it and the way they say it. The more similar, the greater the ease of comprehension. На RapidShare нет файлов, точно нет первых, 7 и 8.